In 1928, a modern telecommunications company begins to operate in Madrid. The series tells the turn in life that four young women take when they start working for this company. The four of them feel attached in different ways, to their families, their partners, or their memories. Part of the focus of the show is the hardships working women faced in the 1920s. In 1920s Madrid, a young woman named Alba with dreams of living a new life in Argentina is wrongfully accused of murder. A corrupt police officer agrees to let her go if she pulls off a heist for him at the telephone exchange. Francisco makes a deal with Lidia. Marga is worried for what she saw on the party. Carlotta's father interferes in her life. The Police are called in when Lidia's identity is questioned. Francisco's wife is suspicious and asks Carolina for help. Marga has a date to lunch with Pablo. Angeles finds out more about Mario's infidelity. Carolina threatens to reveal Lidia's true identity. Miguel tells Carlota to make a decision about their relationship. Everything changes for Ángeles. Lidia helps Ángeles with her escape from town. Carlota works for Sara to get out of prison. Carlos has a fight with his father, with tragic conquences. The Cifuentes family mourns their recent loss. Lidia has to be honest with Carlos and tells him who she really is. New technology from the rotary divides Lidia's loyalty when she must make a choice between Carlos and her friends. As 1928 turns into 1929, Lidia reports to a new boss, Carlota is blackmailed, Marga gets a hidden surprise, and all three rush to Angeles's rescue. Lidia directs a cover-up plan, but a theft complicates things and Marga is caught in a lie. Carlos and Francisco negotiate an alliance. Marisol tries to separate Marga and Pablo. Sara awakens Carlota's suspicion. Lidia sees a decisive difference between Carlos and Francisco. Sara reveals a secret to Carlota. Angeles learns Inspector Cuevas's weakness. Pablo shows Marga his undying love. Lidia helps end an operator strike. Sara seeks medical advice. Lidia gets news that complicates her choice between Francisco and Carlos. Marga learns Pablo is hiding a delicate problem. Lidia gets a tempting offer. Carlota and her friends respond to a plea for help. Angeles takes a risky step in order to learn the witness's identity. The police find a body. Ángeles learns who's been spooking her. Francisco gives Lidia space, while Carlos gives her a surprise. An arrest is made. Carlota gets news about Miguel. Guilt-stricken Marga goes into seclusion. Lidia learns Francisco has made a decision. Ángeles finds herself cornered. Six months later, a catastrophic event deeply affects Lidia, Marga, Carlota, Ángeles and their loved ones. Marga gets a surprise visit from an in-law. With her friends' help, Lidia puts her plan into action. Carlota decides what to do with her inheritance. Ángeles tries to earn Pedro Guzmán's trust. Lidia's desperation worries Carlos and spurs Francisco to offer support. Marga helps Julio cover Pablo's job. Carlota finds a way to promote her cause. Lidia and Francisco visit an orphanage to gather info. Complications arise with Marga when Julio impersonates housebound Pablo, who sneaks back to work. Ángeles must deflect Guzmán's suspicion of a mole. Carlos learns his mother's car was sabotaged and confronts Lidia. Marga has a horrible realization. As the situation escalates, Lidia tries to get to Eva, Marga shocks Pablo, Carlota takes a risk, Ángeles learns a truth and Francisco attempts a rescue. ^ Ryan, Sarah (May 11, 2017). "Netflix announces 400 new jobs in Europe and two new European original series". Netflix Media Center. Amsterdam. Retrieved June 22, 2018. ^ Zaba, Yenia (March 31, 2016). "From the Director and Producers of Velvet and Gran Hotel, Comes the First Netflix Original Series Shot and Produced in Spain". Netflix Media Center. Amsterdam. Retrieved June 22, 2018. ^ Roxborough, Scott (March 1, 2017). "Netflix Previews European Series 'Dark,' 'Suburra' and 'Cable Girls' in Berlin". The Hollywood Reporter. Retrieved March 1, 2017. ^ Rolfe, Pamela (July 13, 2017). "Netflix Orders 'Elite,' Its Second Original From Spain". The Hollywood Reporter. Retrieved July 13, 2017. ^ "When will "Cable Girls" Season 4 be on Netflix?". What's on Netflix. September 15, 2018. ^ a b "Cable Girls - Netflix". Netflix. Retrieved August 3, 2018. 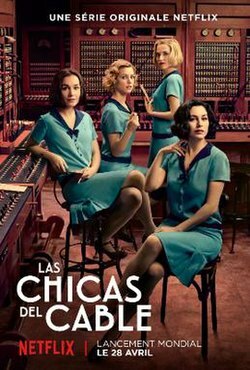 ^ "Las Chicas Del Cable - Listings". The Futon Critic. Retrieved August 3, 2018.